Can you break the Schiltrons? 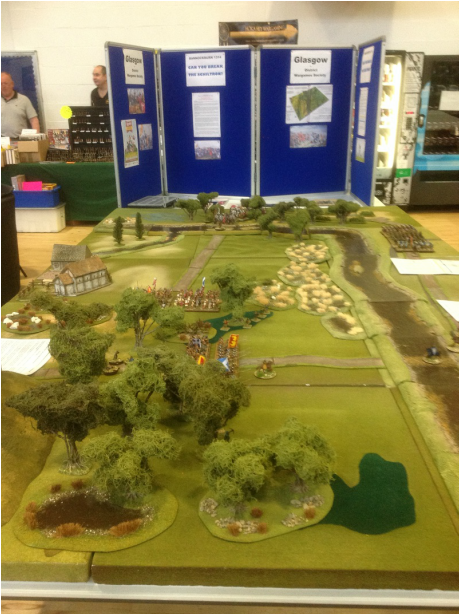 This is the 700th anniversary of Robert Bruce’s victory over Edward II at Bannockburn on 23/24 June 1314 – just 10 miles from this wargame show in Falkirk. The table represents the less well known first day of the battle on Sunday 23 June. We have taken the ‘modern’ interpretation of the battle rather than the traditional site, but as is usually the case with medieval battles there are limited sources. There is somewhat less difference of view over the first day anyway. 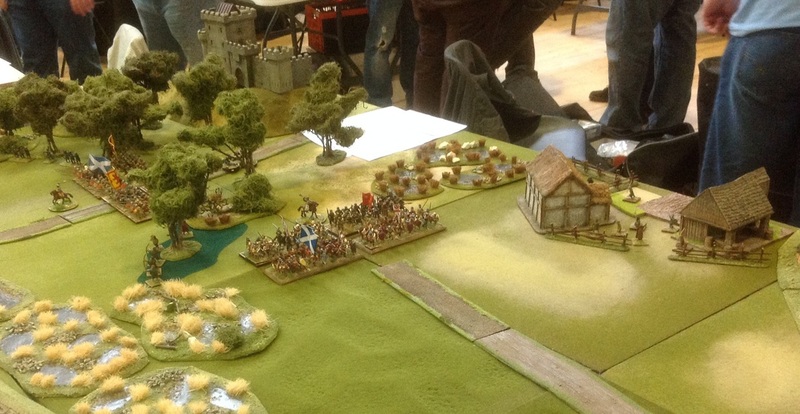 The English army advanced from Falkirk tracked by Scottish cavalry led by Douglas and Keith. The advanced guard (known as the Van), commanded by the Earls of Gloucester and Hereford arrived in the late afternoon. It consisted of some 600 knights and 250 light horse, with an infantry contingent trailing behind including 1500 longbowmen, 150 crossbowmen and 1500 spearmen. They approached on the main road to Stirling that went through the New Park. As they crossed the valley of the Bannock Burn the Scots schiltrons (spear armed units) led by Robert Bruce emerged from the woods to block them. At this point Hereford’s nephew, Henry de Bohun spotted Bruce organising his schiltrons. He either engaged him in a duel, at which Bruce nimbly avoided the charge and cleaved him with his battle axe, or de Bohun seeing the number of Scots turned around and was hacked from behind by Bruce. We will go with the heroic version today! The English (ignoring for now the Scots who fought for Edward) knights, without waiting for their infantry, then charged the schiltrons and were repulsed. As Edward Bruce’s division arrived in support, the English withdrew. While this was happening another force of knights commanded by Sir Robert Clifford, between 300 and 500 strong, made a flanking move towards Stirling along a track known as ‘the Way’. They were probably unobserved because of the woods and were spotted as they approached St Ninian’s Kirk. 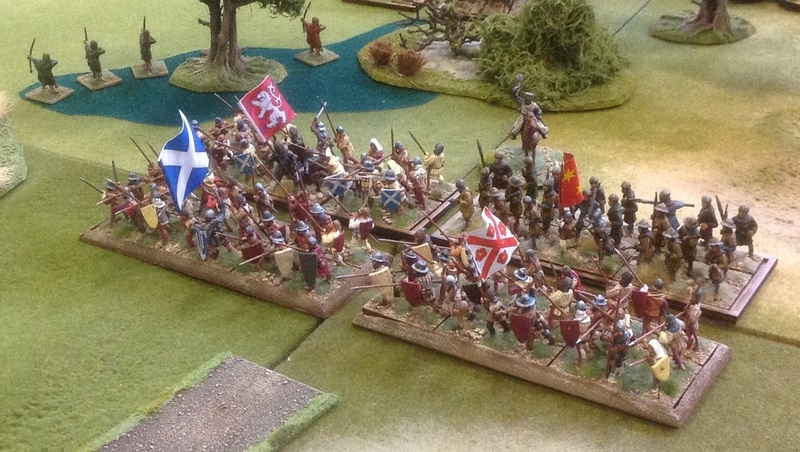 A Scot’s division commanded by the Earl of Moray advanced from the woods into the open to block them. They formed a circle of spears (schiltron), and awaited the English charge. Despite wiser heads warning against an unsupported attack (there were no archers with Clifford’s force), the knights charged recklessly. They failed to break the schiltron and the survivors made their way back towards the main force. That ended the action on the first day. It is significant because it gave Bruce the confidence to fight the following day, when his original plan was probably to retreat into the Lennox. Harsh experience had taught Bruce to avoid pitched battles. The confidence of Edward’s army had been damaged, but only a small element had been engaged and he probably also believed that Bruce would withdraw. As a consequence he camped much closer to the Scots army than was wise. This also contributed to Bruce’s decision to fight the next day. The rest, as they say, is history. The battle will be refought using Hail Caesar rules. The armies consist of 28mm figures from various ranges including Claymore Castings, Essex, Foundry, Black Tree, Old Glory and Front Rank. Participants will play the part of Gloucester or Clifford. Can you reverse history and break the schiltrons? The rules are ‘Hail Caesar’ a straightforward set of ancient and medieval wargame rules published by Warlord Games (see playsheet). You will play the part of the Earl of Gloucester commanding the English vanguard, or alternatively Robert Clifford commanding the English flank attack. You move your troops by saying out loud what you want them to do (advance towards, charge etc), by unit or whole division, then roll two D6. Anything above 8 means the troops don’t move. 7/8 means one 6” move, 6 means two moves and 5 or less means three moves. A double six (12) is a blunder! Roll against blunder table on play sheet. 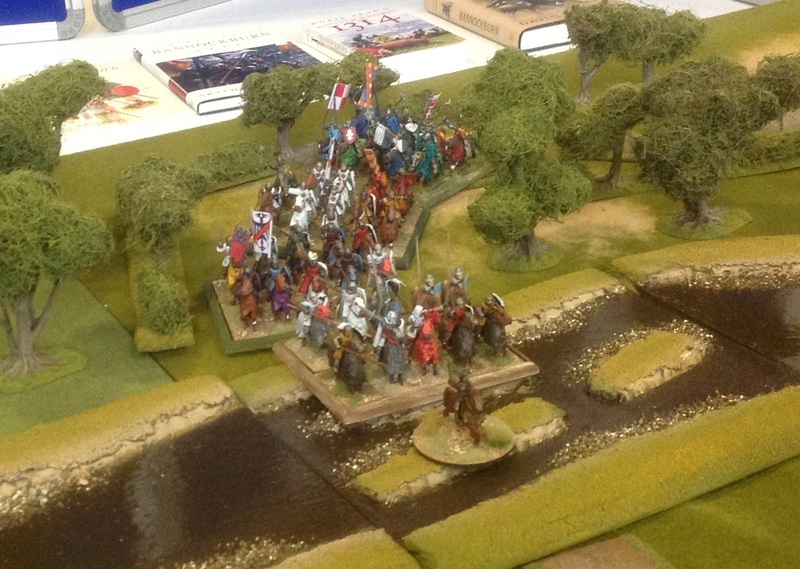 If you are Gloucester you can decide to halt your knights and await the arrival of the English foot in your command. However, for every move you decide to do that you must roll a D6. On a 5 or 6 your knights call you a coward and charge the nearest enemy anyway! The woods, except for the tracks, are very difficult terrain, no go areas for knights, the rest of the off road terrain is difficult terrain to represent the boggy ground. Slow going (one move only) and knights lose their charge bonus. For combat, you roll the number of dice indicated for troop type below (clash in charge move sustained afterwards). Support units roll ‘short’ column. 4 or better (after modifiers and special rules) is a hit. The defender then makes save against morale value (after modifiers and special rules) to determine casualties. Then repeat for other side. Winner is side that inflicts most casualties. Loser takes a break test and applies the outcome on chart. 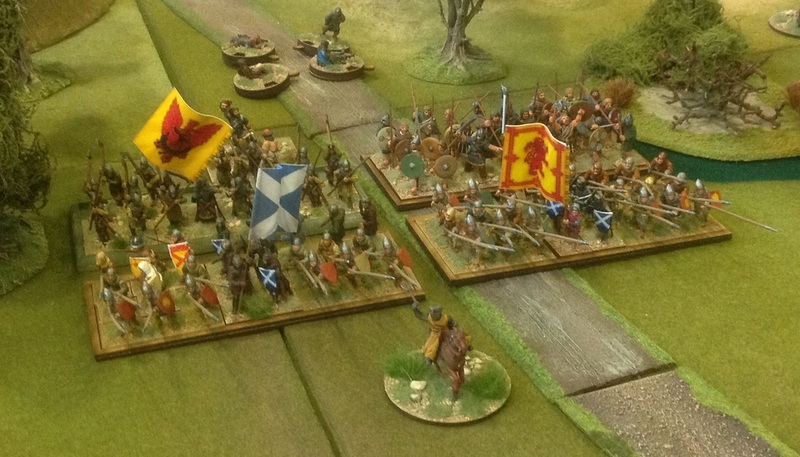 You win if more than half the Scottish schiltrons units break. Onwards to Stirling!